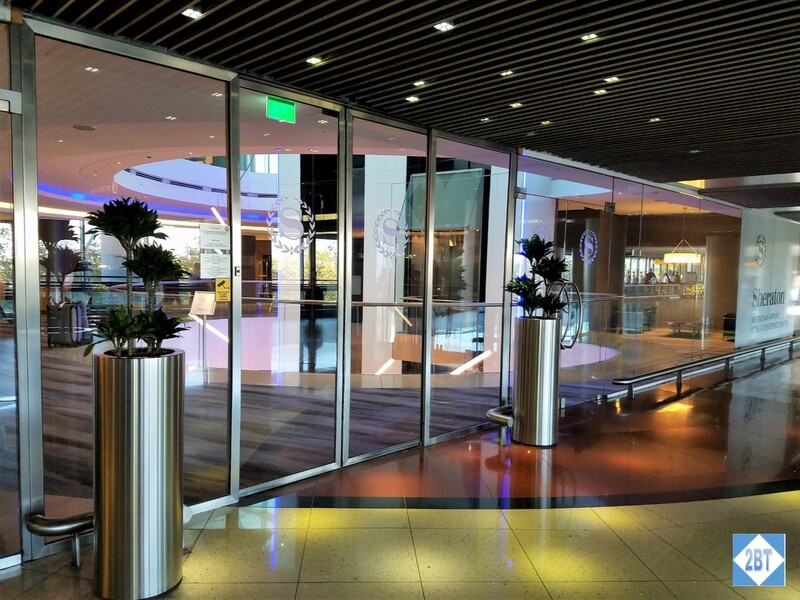 We entered from the airport directly into the hotel’s lobby. 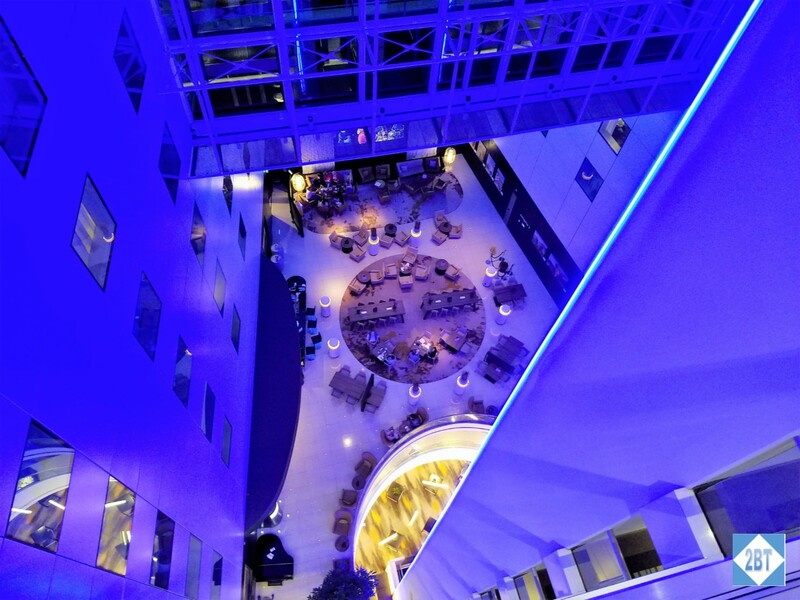 The hotel has a large center atrium that stretches from the lower levels all the way up through to the roof. That helps make the lobby feel more open than it really is because the ceiling seems somewhat low. We did have to wait for other guests to be helped but we were checked in by a friendly staff member who thanked us for our loyalty and recognized our status. Unfortunately our Gold status did not earn us breakfast but we did accept points as our welcome amenity. 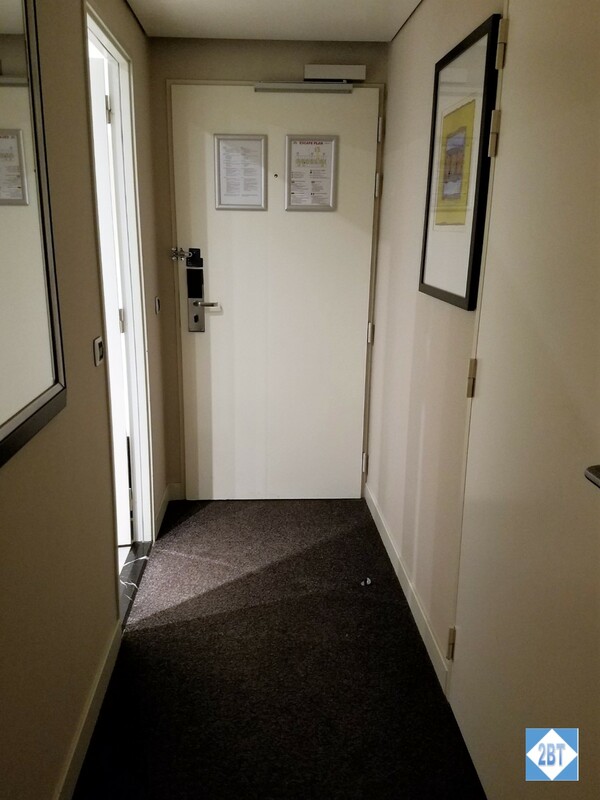 With the floor basically being in an O-shape, the elevators were on the exact opposite side of the lobby thus we had to walk around it with our luggage. We took the elevator up to the 8th floor. 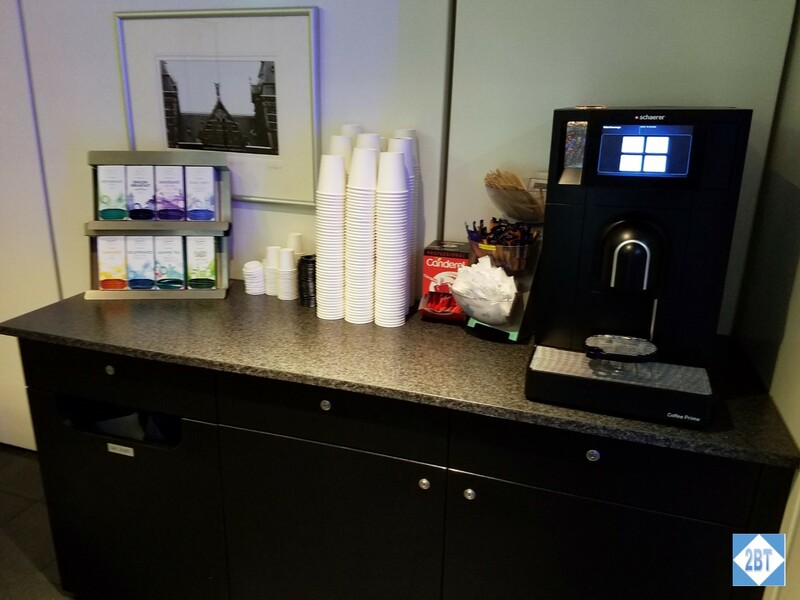 Near the elevator was a coffee/tea station for the entire floor, along with the vending machine. We walked down the hallway almost to the end and found our room, 819, on the left. 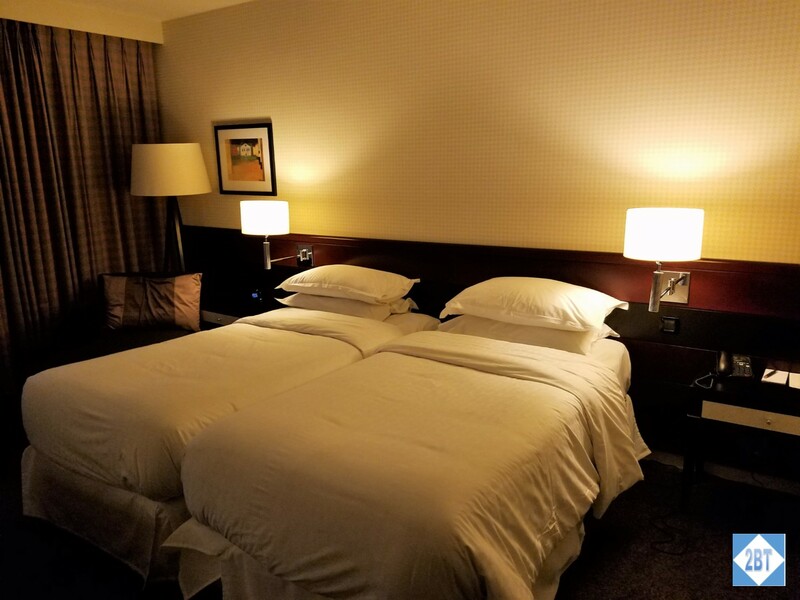 We had reserved a twin room and found the room layout to be a very standard one. 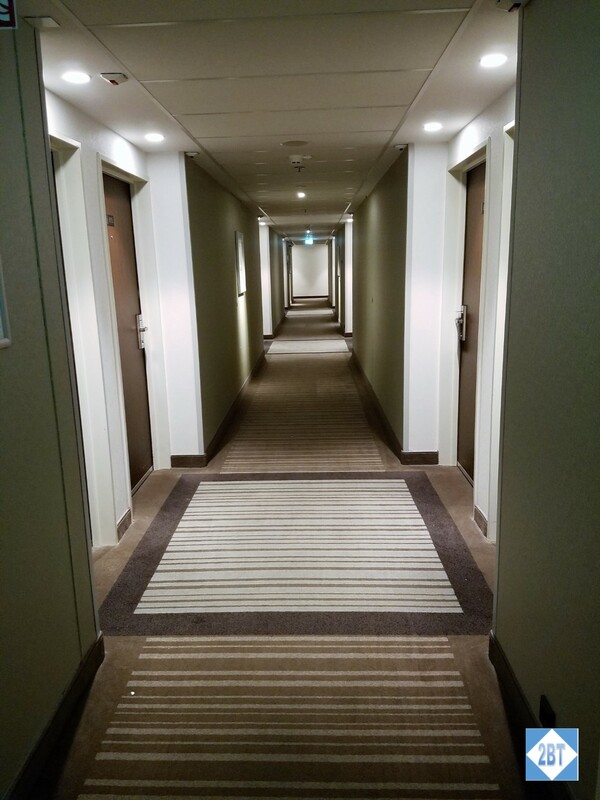 There was a small entry hall with the bathroom on the right. The beds made it appear that this room could be utilized as either a king or twins, depending on what was needed as the beds were very close together. We didn’t really care, it’s just always funny-looking to see this setup. 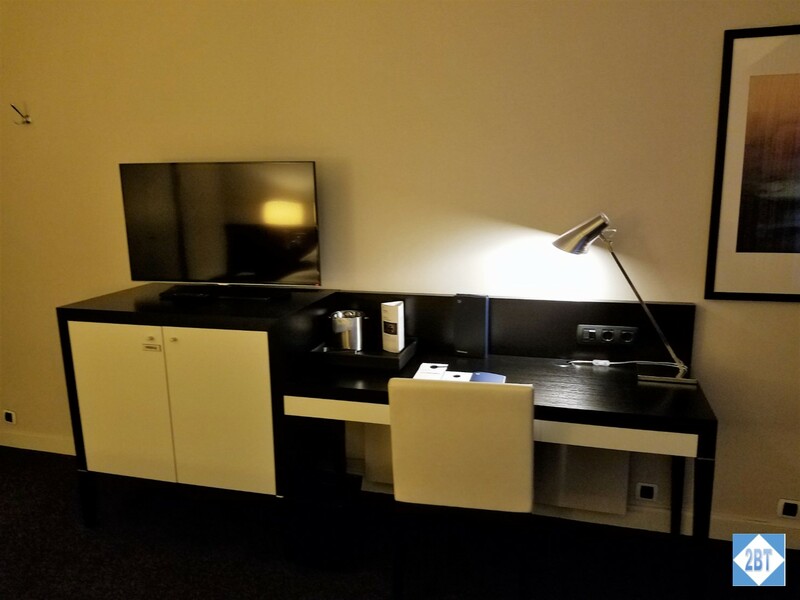 Each bedside table had an electrical outlet, which was good. A second one would have been better. There was a chair with an ottoman in the corner. I utilized this as a luggage stand. 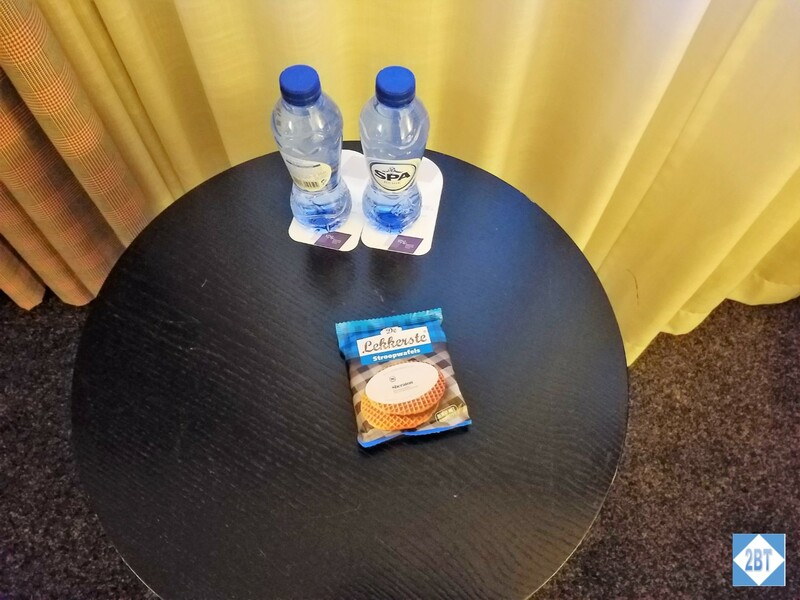 Near the chair was a side table with a couple of bottles of water and a packet of stroopwaffles I saved for later. 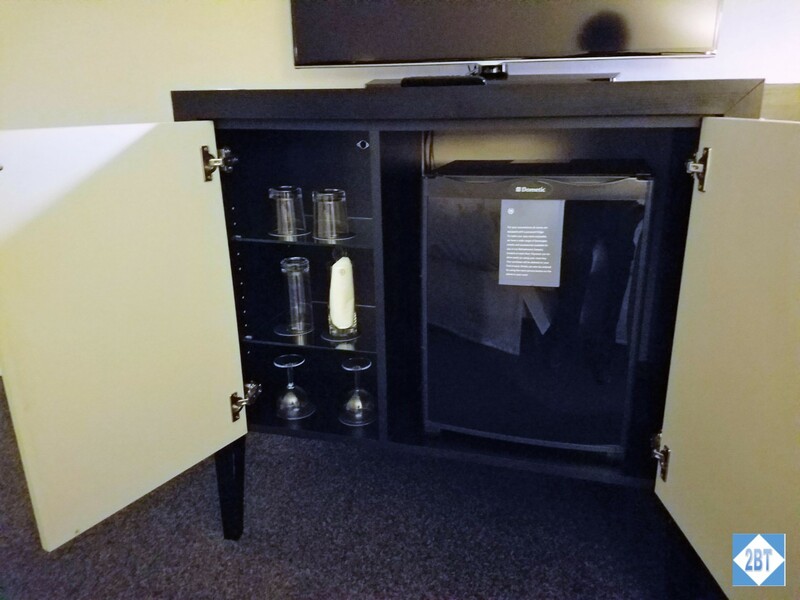 Across from the beds was a piece of furniture that combined the desk and a cabinet that housed the mini-fridge. The TV was wall-mounted over that. There were several more easily-accessible outlets on the desk, which we appreciated. 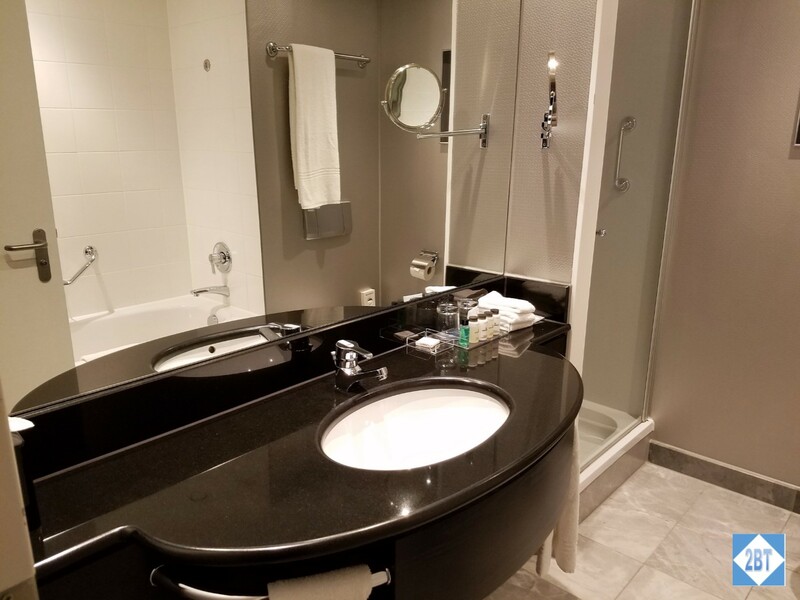 The bathroom was fairly large. While there was only one sink, that meant more counter space for us. 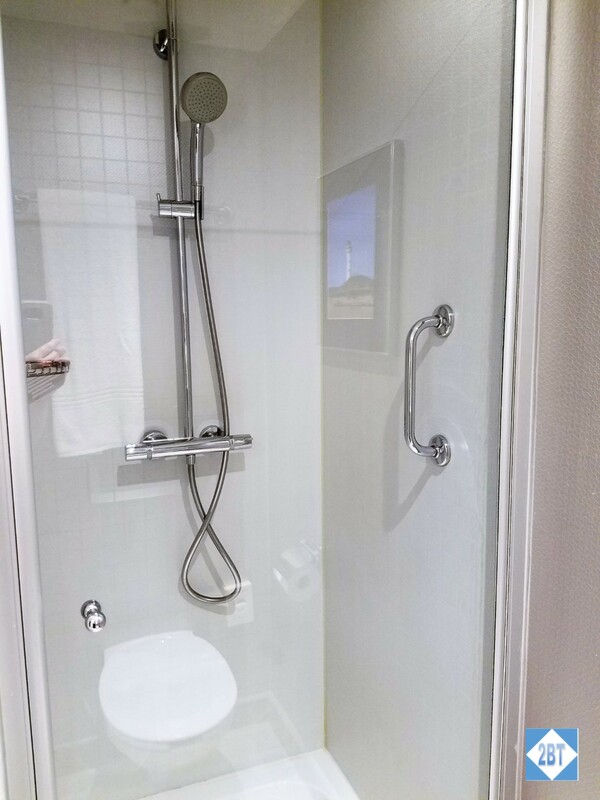 Beside the sink was a shower stall that was not overly large. An extra 6 inches of depth would have been nice. Across from the sink was a soaking tub. 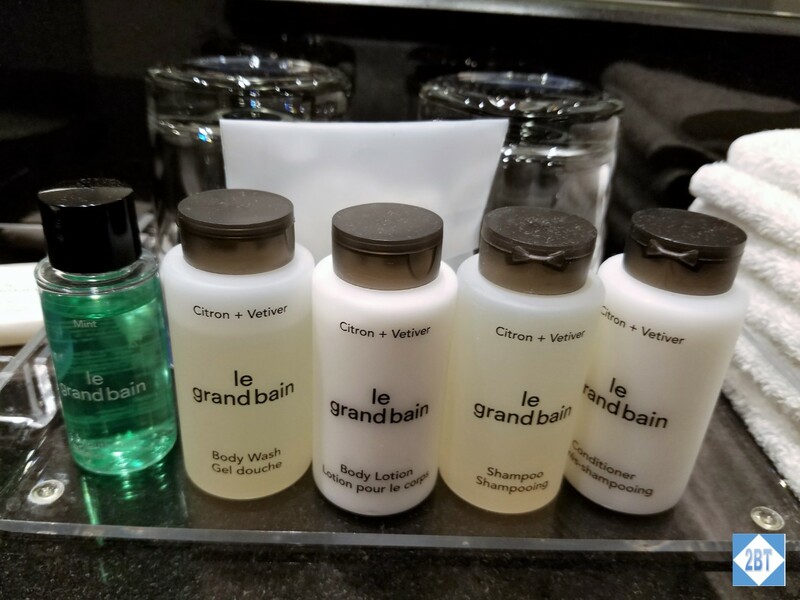 Toiletries were from le grand bain. We were up on the eighth floor and thanks to the open air atrium, we could see all the way down to the restaurant on the lowest level. Since we did not have breakfast included, we bypassed the breakfast buffet and found a restaurant in the terminal for breakfast. The gym was fairly expansive and I was impressed at the array of machines available. 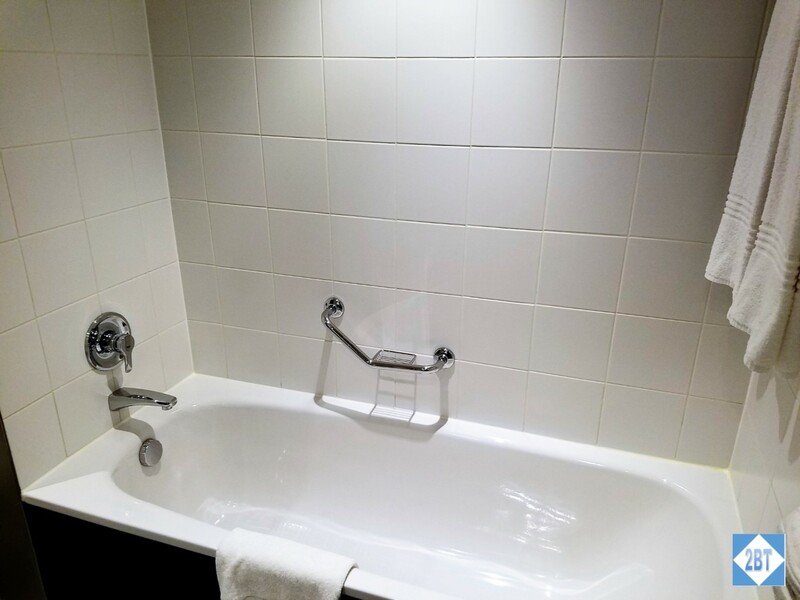 There was also a massage room that could be booked. 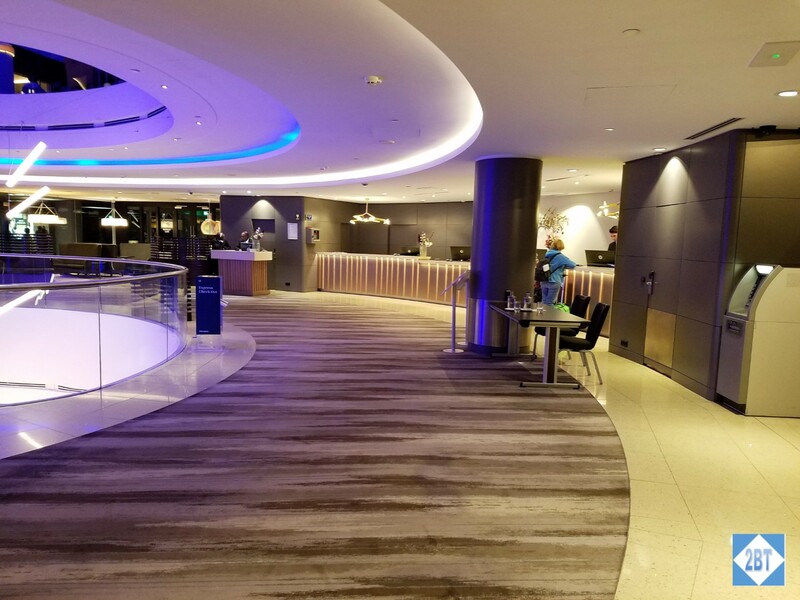 It’s located on the lobby level and its entrance is behind the concierge desk. There was a separate elevator just outside the gym. 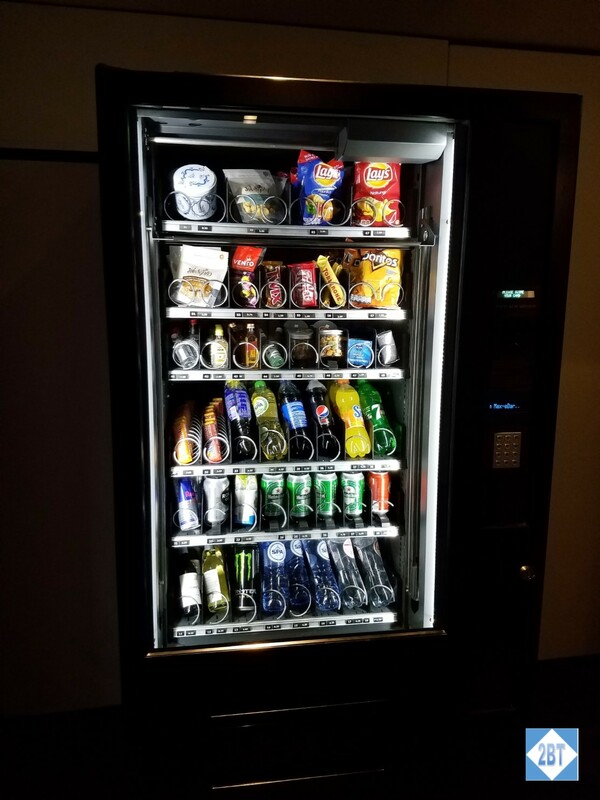 It was located in the other wing from ours. I just happened to see it as I went in search of the lounge (to which we didn’t have access). 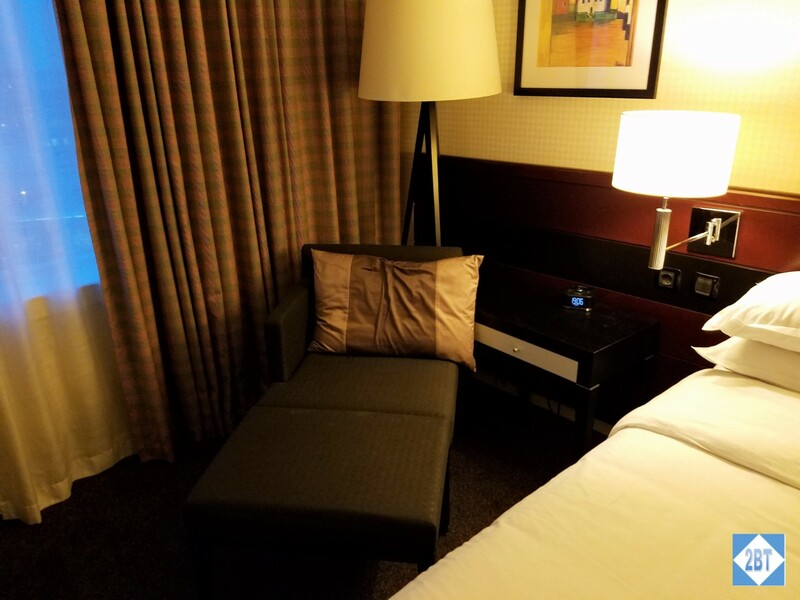 The room wasn’t cheap as we ended up paying about $275 for our one night stay but with the elite bonus and the 500 points welcome gift we earned over 3000 points for this stay. This hotel is super-convenient, especially if you have an early morning flight. We were lucky to be able to lounge around the next morning before our afternoon flight to Iceland and it was nice not to be in a rush to get to the airport from our hotel.